Priori Incantatem: Harry Potter Memories – Chapter Three: Petrificus Totalus! From the time I first opened Harry Potter and the Sorcerer’s Stone to when Goblet of Fire hit shelves, less than a year had elapsed. New Harry Potter literature had been a constant and continuous part of my seven-year-old life, but that era was over. Though none of us knew so at the time, it would be three whole years – roughly equivalent to three decades in kid years – before Rowling released another book. It would have been an absolutely grueling wait, but producer David Heyman and Warner Bros. Pictures were already hard at work insuring that the intervening time would be anything but uneventful. A year before the release of Goblet of Fire, they had purchased the rights to the first four novels and immediately set to work at producing what would become the single most successful film franchise of all time. I obviously had no knowledge of this back then; all I knew was that my favorite book was being turned into a movie, and that excited me to no end. Warner’s marketing team knew exactly how to exploit that boundless excitement, and I have many fond memories of the mammoth hype surrounding the release of the first movie. The original teaser poster, released during the 2000 Christmas season, depicted an owl flying through a starry night sky to deliver Harry’s Hogwarts letter. It featured no characters and gave no indication of what the movie was going to look like, but it still caught my attention every time I saw it in a theatre. A rousing teaser trailer followed in early 2001, and remains to this day one of the greatest film previews I have ever seen, perfectly tailored to make every Harry Potter fan worldwide cry tears of joy. The teaser is chiefly comprised of various money shots, like the cascading letters, the Hogwarts Express, the Great Hall, each of the major characters, and Gringotts, accompanied by the debut of John Williams’ fantastic score. Thanks to this trailer, “Hedwig’s Theme” was iconic nearly a year before the film opened, and though I loved seeing images of all my favorite characters and locations from the book, it was the music that really stuck in my mind. That brief, two-minute teaser had gotten many things right, but nothing evoked the spirit of Rowling’s work more than Williams’ harmonic magic. The hype only increased from there, with the speed and force of an out-of-control freight train, until the film’s November 16th release date. I remember watching the trailers religiously online; checking Warner Bros’ official Harry Potter site for updates, news stories, and to play some surprisingly fun and addictive online games (the website has since become much less interesting); eating the Harry Potter promotional candies like Bertie Bott’s Every Flavored Beans; and going back to read the first four books again all on my own, since my parents had read them with me the first times through. I bought many of the toys, mostly Lego sets, and began watching Kids WB religiously for their Harry Potter coverage and contests. With the help of my parents, I entered a few of their massive contests, and for the first and so far only time in my life, I actually won something – and not just some flimsy little consolation prize, either. 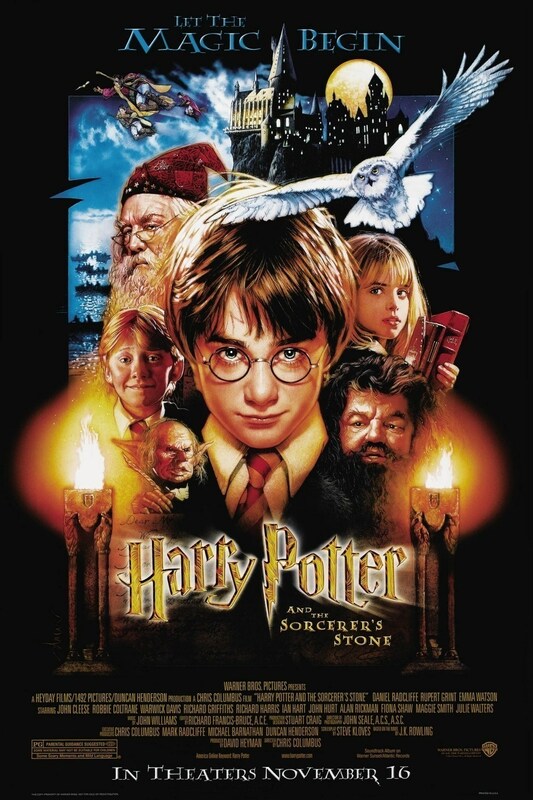 I arrived home from school one day to find that a full-size print of the “Sorcerer’s Stone” theatrical poster had arrived in the mail; a Drew Struzan masterpiece, it’s still one of my favorite posters, and currently hangs above the dresser in my room. A few weeks later, I won a Hogwart’s Express train set; not just any old toy, but a top-of-the-line electric Bachmann brand train, gorgeous and, I suspect, very expensive. Every Christmas, my family still busts this out; it’s a magical piece of Potter memorabilia. The hype was such that by the time November 16th arrived, I doubt I had ever been so excited for anything in my entire life (though Peter Jackson’s “The Lord of the Rings” would rival that claim a month later). My parents and I had visited the local United Artists Denver West theatre and bought our tickets weeks in advance for opening night, a wise decision seeing as, when opening day finally arrived, showtimes were sold out everywhere. Even though we arrived at the theatre early, the lines were already massive. It was unlike anything I had ever experienced before; there were many families just like mine eager to see the film, but also adults, couples, and plenty of people in costume, an eclectic audience all ready to have their world rocked. We film critics like to talk about the movies that sparked or influenced our love of cinema, and for me, “Harry Potter and the Sorcerer’s Stone” was a seminal moment on the road to reviewing. Being a local theatre, Denver West is still one of my frequent haunts, and whenever I see a movie in Auditorium 6, I feel a wave of nostalgia; because when the lights went down on November 16th, 2001, and the magical sounds of John Williams’ celeste hushed the audience, the course of my life would start to take shape. The first and greatest prerequisite of being a film critic is a love of movies, and until that time, no movie had ever impacted me so strongly. When I walked out of the theatre two-and-a-half hours later, I had a new favorite movie and a newfound appreciation for the art of cinema. The cynics of the world will tell you that I would have loved a Harry Potter movie no matter what, that the film’s quality was a non-issue to my forgiving eight-year-old brain. That could not be further from the truth. Yes, as a kid, I was chiefly concerned that the film stay accurate to the novel I held so dear, a concern I have since gravitated very far away from, but accuracy alone was not going to win points in my book. To this day, despite my best efforts, I can’t quite put into words what makes the Harry Potter novels so wonderful; they possess a magical atmosphere that is simply unlike anything else, and when I look back and ponder why I immediately loved the “Sorcerer’s Stone” movie so much, I can only conclude that it wasn’t plot or character accuracy that won me over. Director Christopher Columbus and his team, with lots of help from maestro Williams, had captured the indescribable spirit of Rowling’s books on screen and that, above all else, made me giddy. Of course, both the story and the cast were perfect. From a modern critical standpoint, the slavishness to the novel causes severe intermittent lags in pacing, but back then, I never wanted the movie to end, pacing be damned. The look, sound, and dialogue of the film were all spot-on; even though everything looked different than it did in my head, I still really enjoyed Columbus’ take on the visuals, and found even more satisfaction in the characters. From the moment he appears in the cupboard under the stairs, Daniel Radcliffe is Harry Potter, a trick far more complex than simply giving a skinny kid glasses and a scar. Harry is an incredibly well developed character in the novel, and as I have already established, I felt like I had a psychic connection to the character when I read the books. I am sure many other children my age did thought the same, so we were always going to be the harshest critics of Harry; looks alone weren’t going to cut it. Thankfully, Radcliffe embodied Harry in mind, body, and spirit, possessing the authentic innocence and senses of wonder and morality that no other child actor could have so perfectly captured. Ten years later, Radcliffe and Harry have both grown, but are still as inseparable as they were all those years ago. But Radcliffe was merely one member of one of the single most impressive casts in film history, a cast that has continued to grow and develop in both numbers and talent throughout the series. Just as Radcliffe was the perfect Harry, Rupert Grint excelled as Ron from the start; even back then, Emma Watson’s take on the character didn’t quite match my interpretation, but I felt she provided a good, perfectly valid alternative, and she’s only gotten better as time has passed. Put together, the trio is undoubtedly one of the all-time best-cast teams, their chemistry undeniable from the start. And from legends like Richard Harris, Dame Maggie Smith, and Alan Rickman on down to lesser-known but equally superb thespians such as Robbie Coltrane and Warwick Davis, the adult actors lent a superb sense of gravitas to the proceedings. I did not stop talking about the movie for weeks, but then again, neither did anyone else my age. When we came back to school on Monday, it was all anyone could discuss. That was also the day I wrote my first ever ‘film review.’ My teacher, Mrs. Juran, had us write a short essay every Monday about our weekend, and the subject of mine, of course, was Harry Potter. I imagine I made gratuitous use of words like “great” and “perfect,” and I must have enthusiastic exclaimed it was “just like the book!” four or five times. I saw the film in theatres more times than any other movie up to that point – at least five – and along with the release of “The Fellowship of the Ring” one month later, films had suddenly become one of my driving passions. That Christmas, I got the “Sorcerer’s Stone” video game for my first ever game console, a Nintendo Game Boy Color (a system with enough nostalgia to fill ten articles on its own). I really loved that game, even though it often frustrated me to no end. It is a standard RPG, a sort of ultra-simplistic “Final Fantasy,” so while I find it easy to play today, it was really difficult as an eight year old. I liked the challenge, though, as it gave me extra time to explore Hogwarts in all its 8-bit glory. I still enjoy playing the game today from time to time, as it’s both a nostalgic treasure and a decent RPG. The PC version of the game is pretty awful, technically speaking, but I loved playing it then and I love playing it now; a traditional platformer, it’s one of those games that is so bad it’s good, with quirky animations, bad voice acting, and hilariously underwhelming level design – plus a totally unfair difficulty spike once the player reaches Voldemort. It’s also got one of the most memorable endings I have ever seen in a game; if the player collects enough Bertie Bott’s Every Flavored Beans for Fred and George, they will fill Snape’s office with them at the end. This, as you might imagine, does not amuse the potion’s master. I consider it a great tragedy that Alan Rickman never got to perform this scene himself. In May of 2002, the film arrived on the still-fresh DVD format; as one of the earliest discs my family bought, it changed my perception of how fun the format could be. I watched the film many times, obviously, but I also spent hours exploring Disc 2, which was light on actual bonus features (and would therefore annoy me today) but full of interactive DVD games. Commercials had heavily advertised the presence of Deleted Scenes on the set, which made me think the movie itself had actually been extended. Alas, I was wrong (we would have to wait another seven years for that), so I naturally assumed the Deleted Scenes were bonus features on Disc 2. But as I started exploring the disc, I found that I was wrong again. Even the packaging advertised the Deleted Scenes, so where were they?!? I was not the only one annoyed by this; every kid who owned the DVD wanted those scenes, and they were nowhere to be found. After a few weeks of searching, I learned online that to find the Deleted Scenes, you had to play an elaborate series of DVD games. First, you had to select the right bricks in the wall behind the Leaky Cauldron to get into Diagon Alley, then go to Gringotts and collect money to go buy a wand. After that, you travel to Hogwarts, take some classes, and then enter a special series of button commands to reach Fluffy, the three-headed dog. After putting Fluffy to sleep, you go through all the trials guarding the Stone, and once you finally find it, you are taken to a menu where the Deleted Scenes are kept. By that time, marketing for the upcoming “Chamber of Secrets” movie had already begun in earnest, and the cycle of hype I’d had fun with on “Sorcerer’s Stone” repeated itself once again. I was now in Fourth Grade, a little older, a little wiser, and more excited for Harry Potter than ever before. Once more, the trailers and TV spots hit all the right notes, and when I wasn’t feverishly watching them repeatedly, I continued to fool around on the official WB Potter website, read stories about the upcoming film and its video game adaptation, and, of course, re-read the book. But I could not spend all my time being excited for the new movie, since I had recently started a new ‘job’ that was taking up lots of my time – and I was loving every minute. As with “Sorcerer’s Stone,” we bought our tickets in advance, but the lines had been so gargantuan last time that we decided to arrive at Denver West far earlier than we had the year before. It still wasn’t early enough. I’m not sure why, but the lines had doubled in size this time, and despite our punctuality, we were near the very back. Once we finally got into the theatre, the only seats left were at the very, very back, and that just would not do. We were in Auditorium 8, one of two huge, identical auditoriums at Denver West, and Auditorium 9, its twin, was showing the movie fifteen minutes later. So rather than sit in the very back, we snuck into the next screening in Auditorium 9. This too was pretty full, so we had to sit near the front, four or five rows into the main section. That turned out to be a revelatory experience that still influences how I watch movies; up to that point, I liked to sit in the middle or even further back, but once I saw “Chamber of Secrets” up close, I could never go back. Watching “Chamber,” I was fascinated by my visual immersion in the world of the film, in the ability to allow my eyes to dart around the screen and focus on little details here and there that one would not see if one sat farther back. Only being able to focus on the image as a whole is, after all, what DVD is for. This is a concept I have tested on hundreds of movies since “Chamber,” and it still holds up. In my humble opinion, sitting reasonably close to the screen is the best way to see a movie, and being any further back is a massive waste of time. 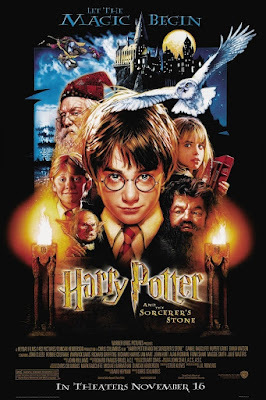 I would not, of course, have been impressed if the movie had disappointed, but luckily, everything I loved about “Sorcerer’s Stone” returned in “Chamber of Secrets,” tweaked and improved with better acting, effects, and a far greater sense of scope, danger, and darkness. The new characters, like Dobby and Professor Gilderoy Lockhart (played perfectly by Kenneth Branagh) stole the show, while Rowling’s frightening thriller of a story turned out to be just as scary on screen as it was in print. There were some surprises in store, like hearing how much Daniel Radcliffe and Rupert Grint’s voices had changed since the first film, or seeing Lucius Malfoy try to use the ‘Avada Kadavra’ killing curse on Harry at the end (resulting in a much darker and, perhaps, logically flawed version of the scene than what happens in the book). Still, the biggest surprise and best moment of the film came at the very end, when Hagrid enters the Great Hall having just returned from Azkaban; after expressing his heartfelt gratitude to Harry, Ron, and Hermione, Harry stands up and begins applauding Hagrid, eventually getting the whole castle to join in. I doubt there was a dry eye in the theatre after that. Looking back on them today, Christopher Columbus’ films were not perfect; I love them dearly, not only from nostalgia, but because they are genuinely good films. Still, their Achilles heel lay in their unwavering devotion to the novels. Columbus was too afraid to veer away from the books, resulting in adaptations that are a bit overlong and lacking in the creativity needed to truly achieve greatness. It is no surprise that Hagrid’s triumphant return to Hogwarts, seen only in the film, is the best, most emotionally moving scene of the first two movies, as it was the one scene no audience could have seen coming. Columbus did a very solid job starting the series off on the right foot, and if his films could not be perfect, then I find it comforting he at least ended his tenure with one of the best scenes in the entire series. After “Chamber of Secrets,” movie-craze wound down. Though I again played and loved the Game Boy Color and PC versions of the game, and enjoyed the eventual DVD release (which thankfully featured the Deleted Scenes front and center), I grew less interested in the movies as Summer 2003 approached. I did not need substitute Potter anymore, because J.K. Rowling was finally ready to make her triumphant return to the world of literature. The long hiatus was almost over, and the Order of the Phoenix was finally ready to take flight. To be continued in Chapter Four: Rennervate!